Even for a guy whose famously abundant output makes a joke of the word prolific, this has been a spectacularly productive year for Robert Pollard. 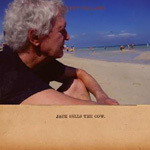 Jack Sells the Cow is his second solo album in a year that has already seen the release of two records by the reunited Guided By Voices and will see yet a third before it�s done, along with a fair amount of touring. So what makes this a Robert Pollard record as opposed to a Guided By Voices record? The best answer is that it�s just a matter of nomenclature, but the absence of contributions from other members of the reunited GBV is probably the easiest way to put Jack in its box, if putting things into boxes is your thing. The superabundance of melody and densely packed stylistic swerves and flourishes on Jack rival anything Pollard�s recorded recently, and while five albums in a year might strike some as overkill, you have to imagine his relentless output is a less-than-calculated move�a smarter businessman would hold back product so as to build demand, but Robert Pollard has never been a businessman. He�s an artist, full stop, at a time when it seems that every artist / musician is expected to have an MBA. He�s scrapped enough proposed albums to fill many another group�s entire discography; he puts out records because he likes the records. And he hopes you�ll like them too. Jack Sells the Cow sails over the moon of your heart in a snappy 32-plus minutes and, despite the lyrics� sometimes heavy subject matter, comes off as perhaps the sprightliest, most light-footed music Pollard has recorded this year. Of the quincunx of Bob-related releases this year, we�d suggest you put this one in the center, and hold tight. These suckers move. CD release date 9/18/2012 and LP release date 10/2/2012.